Demonstrate the Cost Savings Of Switching from OEM Cartridges to CIG Cartridges without Any Sacrifice in Quality | Industry Analysts, Inc.
CIG’s Total Cost of Ownership (TCO) worksheets are convenient tools for dealers to demonstrate to customers the cost savings of switching from OEM cartridges to CIG cartridges without any sacrifice in quality, as proven by BLI. Dealers simply plug in the individual customer’s unique information, such as impressions or prints per month, sell price for the OEM cartridges, and sell price for CIG cartridges. 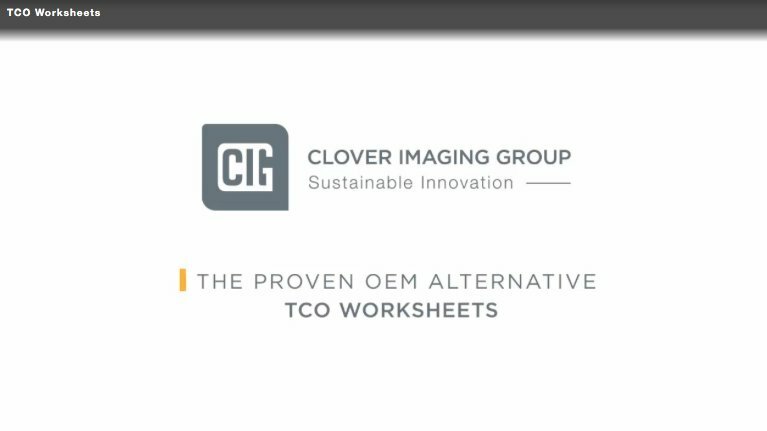 After that, the TCO worksheets do all the work for you, by factoring in the price of the printer, total impressions, and cost of cartridges that you entered, the worksheets vividly illustrate for your customers the total savings of choosing CIG cartridges over OEM cartridges. This entry was posted in Clover and tagged cartridges, CIG, Clover by IA Staff. Bookmark the permalink.